These mini pecan pies for two is a recipe that I’ve been working on for what seems like years. It took so many tries to get these little pies perfect for you. There is something about scaling down a recipe that is just challenging, especially when it includes one egg. But, let’s talk about Thanksgiving because I think that is a lot more fun than the trials and tribulations of recipe testing. You see, when it comes to Thanksgiving, I think we have a pretty good deal up here in Canada; if we want to (and who doesn’t), we can celebrate Thanksgiving twice. I love all holidays, but Thanksgiving holds a special place in my heart. I love that it’s a holiday that is all about the food. Really, Thanksgiving more so than any other holiday is almost 100% food related. That said, I also love that it’s a time to think back and remember what we are thankful for. This is something that I’ve realized I should be doing more than once a year; it’s so easy, in the frenzy of everyday, to forget how fortunate we are. 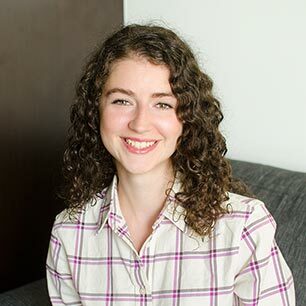 It’s so easy to complain about everything, “I’m tired!”, “I can’t believe how much homework we have.”, “Ugh this project is the worst.” or the famous“Why is it so cold already?” – sound familiar? I will be the first to admit that I often fall into the trap, a negative black hole of sorts. Nothing is ever going to be just the way you want it to be, and that’s OK. That’s life, it’s messy and beautiful. It’s a hard thing to grasp, but I’m trying. And I’m going to try to complain less and see things in a different light, a positive and bright light. 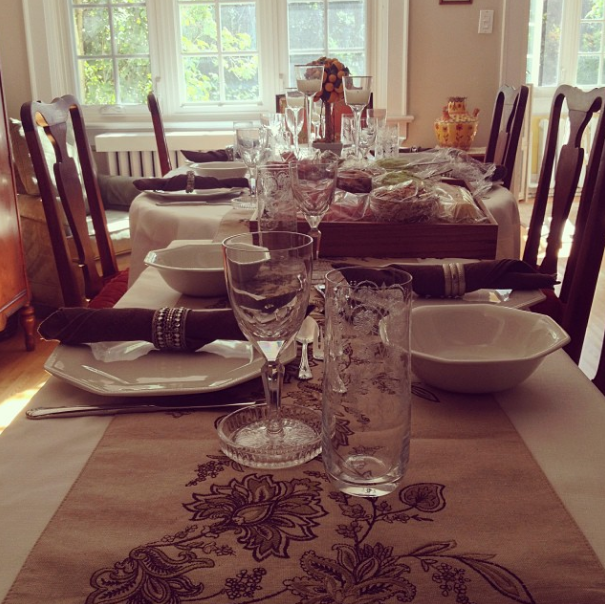 A photo of our Thanksgiving table from last month via instagram. When I think of Thanksgiving dinner, I think of a big crowd, but what if you have a smaller crowd? What if you’re away from home celebrating with one other person? What if you’re having a small “friendsgiving” instead? For these occasions, while they are Thanksgiving, don’t call for a regular pecan pie that feeds 6-8 people. I developed this recipe for Mini Pecan Pies for 2 for those of us that might not have a large crowd to feed this year. But let’s be real, Thanksgiving is as much about the leftovers as it is about the meal itself, I took that into account when creating this recipe – you end up with six mini pecan pies – two for each of your for dessert and then one each for leftovers the next day. These are almost like butter tarts, or pecan tarts I suppose, I used store bought pastry shells, but you can definitely make homemade if you want to. Homemade is 100% better, but every now and then, simplicity wins over and store bought frozen tart shells are a great option. Do you have a small crowd for Thanksgiving this year? 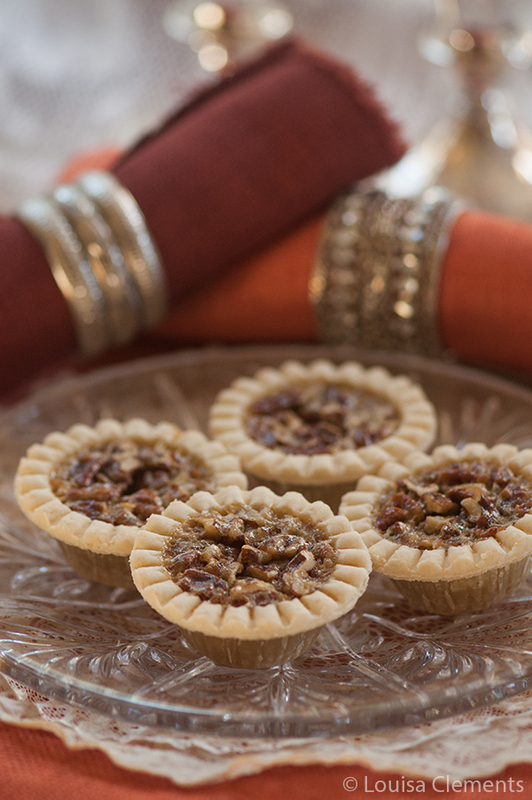 These Mini Pecan Pies for 2 will be perfect for dessert! Whisk together egg, corn syrup, pecans, brown sugar, flour, vinegar and vanilla. Spoon mixture into pastry shells. Looking for a smaller dessert for Thanksgiving this year? Give my mini pecan pies for 2 a try. These are adorable! I made mini pumpkin pies last weekend but they did not look as pretty as yours! Thanks, Davida! I doubt it - I think anything mini is automatically pretty/adorable! These look really good! :) I have been browsing through your website and all your food looks great. When you have the time, could you possibly post some Christmas dessert recipes? Thanks, Serena! Of course, I have lots of Christmas dessert recipes in the works right now. Let me know if there is anything specific you're looking for! I love mini pies because they don't make me feel as guilty so I'm all over these! Thanks Pamela - that's why I love them, too! Hi Sarah,I'm sure you're a great baker! In terms of the measurements, good eye - can't believe I missed that. It's 1 tbsp each - I'm going to go in and fix it now. You can skip the white vinegar, but you might also be able try adding a tiny bit of lemon juice (1/4 tsp) for a little acidity! Thank you so much Lou!